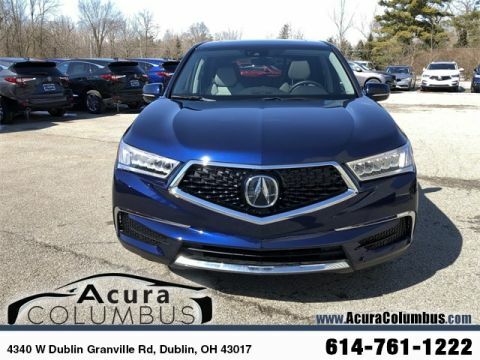 As the brand’s flagship luxury SUV, the new Acura MDX combines its deeply indulgent three-row interior with new technology and a sophisticated 290-hp 3.5L V6 engine to achieve energetic performance even when you’re carrying up to seven passengers or filling up to 90.9 cubic feet of cargo space. 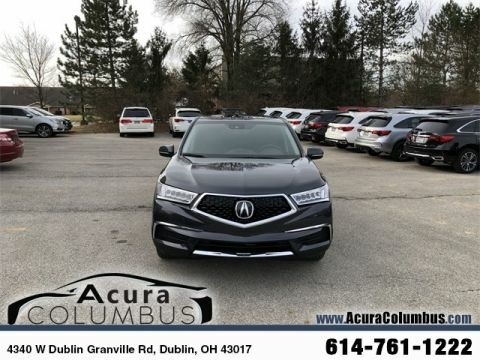 Vehicle has BLUETOOTH, MULTI-VIEW REAR CAMERA, MOONROOF, KEYLESS ACCESS SYSTEM, SMART ENTRY, PUSHBUTTON IGNITION, Acura PERSONALIZED SETTINGS, POWER WINDOWS, POWER LOCKS, CRUISE CONTROL, HEATED SEATS, HEATED MIRRORS, LED DAYTIME RUNNING LIGHTS, 4-WHEEL ANTI-LOCK BRAKING SYSTEM, SECURITY SYSTEM. 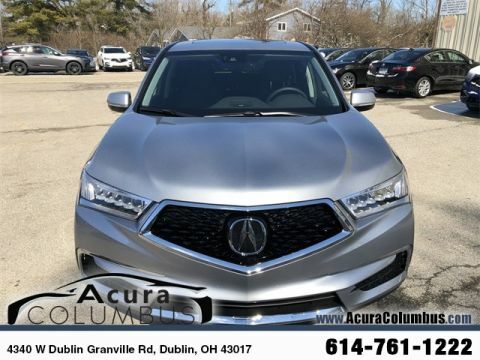 2019 Acura MDX 3.5L Parchment Artificial Leather. 19/26 City/Highway MPG Celebrating 30 Years as Ohio's First Acura Dealer! 614-761-1222 Proudly Serving: Dublin, Columbus, Westerville, Chillicothe, Dayton, Xenia, Springfield, Wilmington, Beavercreek, Marysville, Cincinnati, Cleveland, Lancaster, West Jefferson, Grove City, and all of greater Ohio. 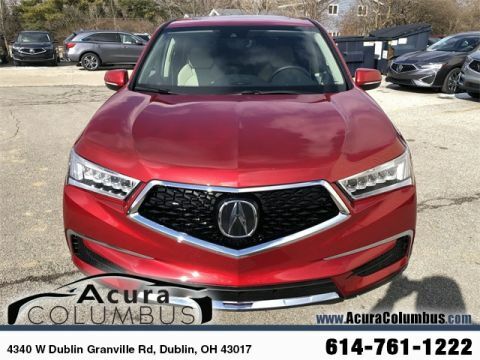 Vehicle has BLUETOOTH, MULTI-VIEW REAR CAMERA, MOONROOF, KEYLESS ACCESS SYSTEM, SMART ENTRY, PUSHBUTTON IGNITION, Acura PERSONALIZED SETTINGS, POWER WINDOWS, POWER LOCKS, CRUISE CONTROL, HEATED SEATS, HEATED MIRRORS, LED DAYTIME RUNNING LIGHTS, 4-WHEEL ANTI-LOCK BRAKING SYSTEM, SECURITY SYSTEM. 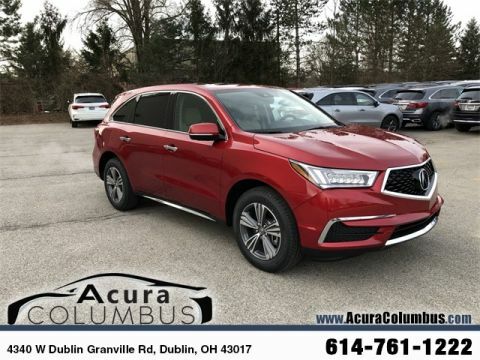 2019 Acura MDX 3.5L 19/26 City/Highway MPG Celebrating 30 Years as Ohio's First Acura Dealer! 614-761-1222 Proudly Serving: Dublin, Columbus, Westerville, Chillicothe, Dayton, Xenia, Springfield, Wilmington, Beavercreek, Marysville, Cincinnati, Cleveland, Lancaster, West Jefferson, Grove City, and all of greater Ohio. Vehicle has BLUETOOTH, MULTI-VIEW REAR CAMERA, MOONROOF, KEYLESS ACCESS SYSTEM, SMART ENTRY, PUSHBUTTON IGNITION, Acura PERSONALIZED SETTINGS, POWER WINDOWS, POWER LOCKS, CRUISE CONTROL, HEATED SEATS, HEATED MIRRORS, LED DAYTIME RUNNING LIGHTS, 4-WHEEL ANTI-LOCK BRAKING SYSTEM, SECURITY SYSTEM. 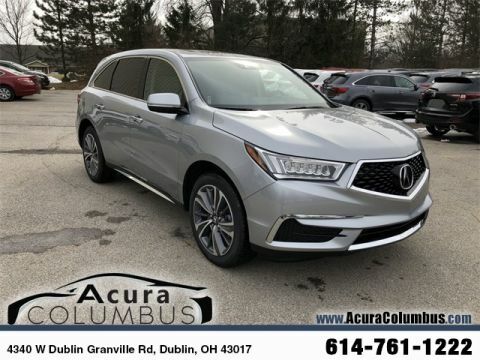 2019 Acura MDX 3.5L Graystone Artificial Leather. 19/26 City/Highway MPG Celebrating 30 Years as Ohio's First Acura Dealer! 614-761-1222 Proudly Serving: Dublin, Columbus, Westerville, Chillicothe, Dayton, Xenia, Springfield, Wilmington, Beavercreek, Marysville, Cincinnati, Cleveland, Lancaster, West Jefferson, Grove City, and all of greater Ohio. 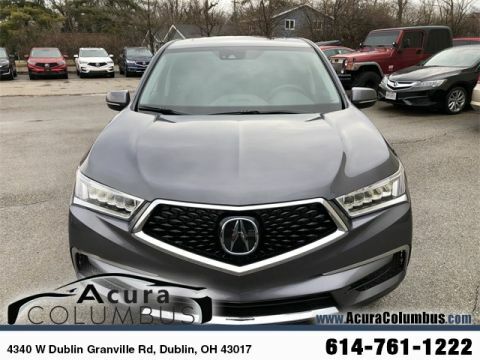 Vehicle has BLUETOOTH, MULTI-VIEW REAR CAMERA, MOONROOF, KEYLESS ACCESS SYSTEM, SMART ENTRY, PUSHBUTTON IGNITION, Acura PERSONALIZED SETTINGS, POWER WINDOWS, POWER LOCKS, CRUISE CONTROL, HEATED SEATS, HEATED MIRRORS, LED DAYTIME RUNNING LIGHTS, 4-WHEEL ANTI-LOCK BRAKING SYSTEM, SECURITY SYSTEM. 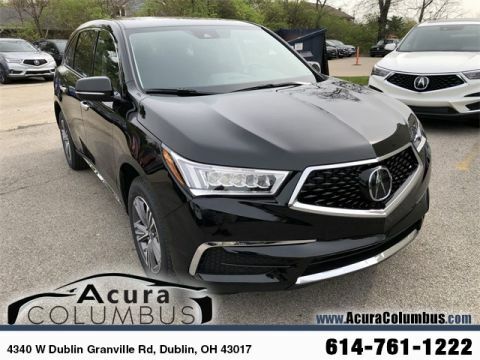 2019 Acura MDX 3.5L Ebony Artificial Leather. 19/26 City/Highway MPG Celebrating 30 Years as Ohio's First Acura Dealer! 614-761-1222 Proudly Serving: Dublin, Columbus, Westerville, Chillicothe, Dayton, Xenia, Springfield, Wilmington, Beavercreek, Marysville, Cincinnati, Cleveland, Lancaster, West Jefferson, Grove City, and all of greater Ohio. 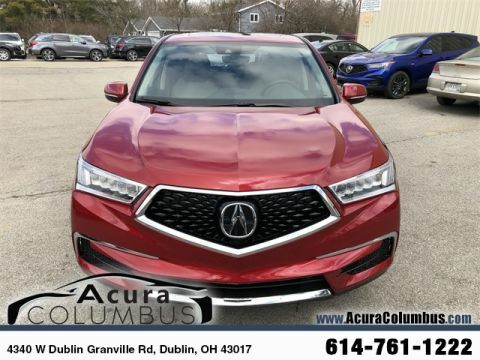 Vehicle has BLUETOOTH, MULTI-VIEW REAR CAMERA, MOONROOF, KEYLESS ACCESS SYSTEM, SMART ENTRY, PUSHBUTTON IGNITION, Acura PERSONALIZED SETTINGS, POWER WINDOWS, POWER LOCKS, CRUISE CONTROL, HEATED SEATS, HEATED MIRRORS, LED DAYTIME RUNNING LIGHTS, 4-WHEEL ANTI-LOCK BRAKING SYSTEM, SECURITY SYSTEM. 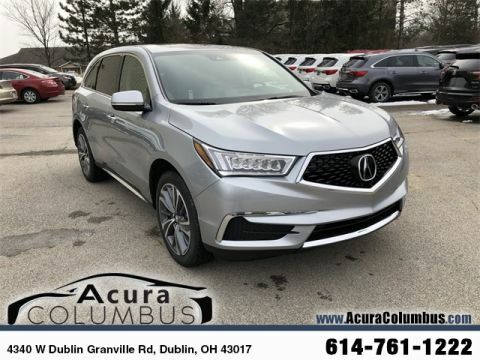 2019 Acura MDX 3.5L Technology Package Graystone Artificial Leather. 19/26 City/Highway MPG Celebrating 30 Years as Ohio's First Acura Dealer! 614-761-1222 Proudly Serving: Dublin, Columbus, Westerville, Chillicothe, Dayton, Xenia, Springfield, Wilmington, Beavercreek, Marysville, Cincinnati, Cleveland, Lancaster, West Jefferson, Grove City, and all of greater Ohio. Vehicle has BLUETOOTH, MULTI-VIEW REAR CAMERA, MOONROOF, KEYLESS ACCESS SYSTEM, SMART ENTRY, PUSHBUTTON IGNITION, Acura PERSONALIZED SETTINGS, POWER WINDOWS, POWER LOCKS, CRUISE CONTROL, HEATED SEATS, HEATED MIRRORS, LED DAYTIME RUNNING LIGHTS, 4-WHEEL ANTI-LOCK BRAKING SYSTEM, SECURITY SYSTEM. 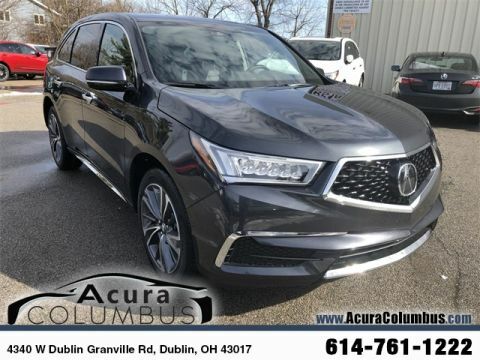 2019 Acura MDX 3.5L Technology Package Ebony Artificial Leather. 19/26 City/Highway MPG Celebrating 30 Years as Ohio's First Acura Dealer! 614-761-1222 Proudly Serving: Dublin, Columbus, Westerville, Chillicothe, Dayton, Xenia, Springfield, Wilmington, Beavercreek, Marysville, Cincinnati, Cleveland, Lancaster, West Jefferson, Grove City, and all of greater Ohio. Vehicle has BLUETOOTH, MULTI-VIEW REAR CAMERA, MOONROOF, KEYLESS ACCESS SYSTEM, SMART ENTRY, PUSHBUTTON IGNITION, Acura PERSONALIZED SETTINGS, POWER WINDOWS, POWER LOCKS, CRUISE CONTROL, HEATED SEATS, HEATED MIRRORS, LED DAYTIME RUNNING LIGHTS, 4-WHEEL ANTI-LOCK BRAKING SYSTEM, SECURITY SYSTEM. 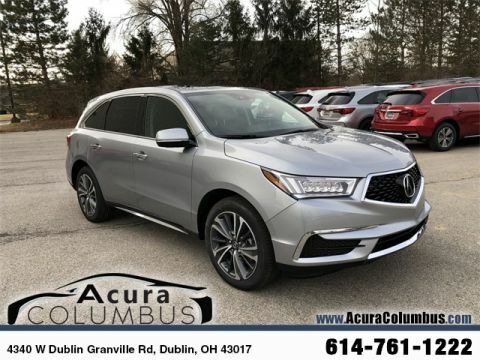 2019 Acura MDX 3.5L Technology Package Gray Artificial Leather. 19/26 City/Highway MPG Celebrating 30 Years as Ohio's First Acura Dealer! 614-761-1222 Proudly Serving: Dublin, Columbus, Westerville, Chillicothe, Dayton, Xenia, Springfield, Wilmington, Beavercreek, Marysville, Cincinnati, Cleveland, Lancaster, West Jefferson, Grove City, and all of greater Ohio. Vehicle has BLUETOOTH, MULTI-VIEW REAR CAMERA, MOONROOF, KEYLESS ACCESS SYSTEM, SMART ENTRY, PUSHBUTTON IGNITION, Acura PERSONALIZED SETTINGS, POWER WINDOWS, POWER LOCKS, CRUISE CONTROL, HEATED SEATS, HEATED MIRRORS, LED DAYTIME RUNNING LIGHTS, 4-WHEEL ANTI-LOCK BRAKING SYSTEM, SECURITY SYSTEM. 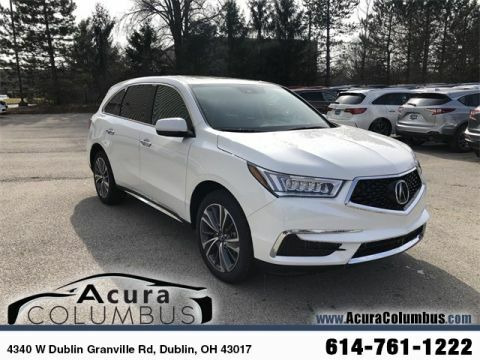 2019 Acura MDX 3.5L Technology Package Greystone Artificial Leather. 19/26 City/Highway MPG Celebrating 30 Years as Ohio's First Acura Dealer! 614-761-1222 Proudly Serving: Dublin, Columbus, Westerville, Chillicothe, Dayton, Xenia, Springfield, Wilmington, Beavercreek, Marysville, Cincinnati, Cleveland, Lancaster, West Jefferson, Grove City, and all of greater Ohio. 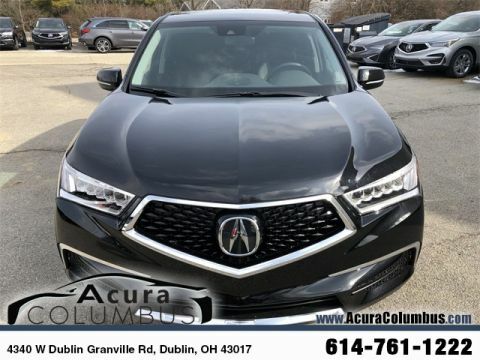 Vehicle has BLUETOOTH, MULTI-VIEW REAR CAMERA, MOONROOF, KEYLESS ACCESS SYSTEM, SMART ENTRY, PUSHBUTTON IGNITION, Acura PERSONALIZED SETTINGS, POWER WINDOWS, POWER LOCKS, CRUISE CONTROL, HEATED SEATS, HEATED MIRRORS, LED DAYTIME RUNNING LIGHTS, 4-WHEEL ANTI-LOCK BRAKING SYSTEM, SECURITY SYSTEM. 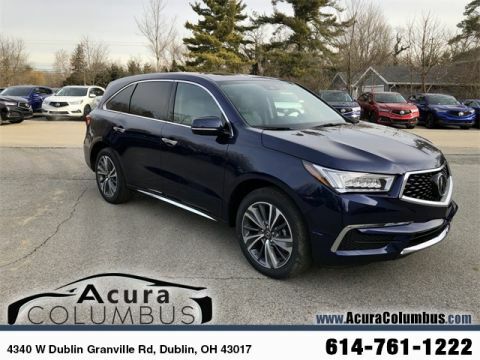 2019 Acura MDX 3.5L Technology Package Espresso Artificial Leather. 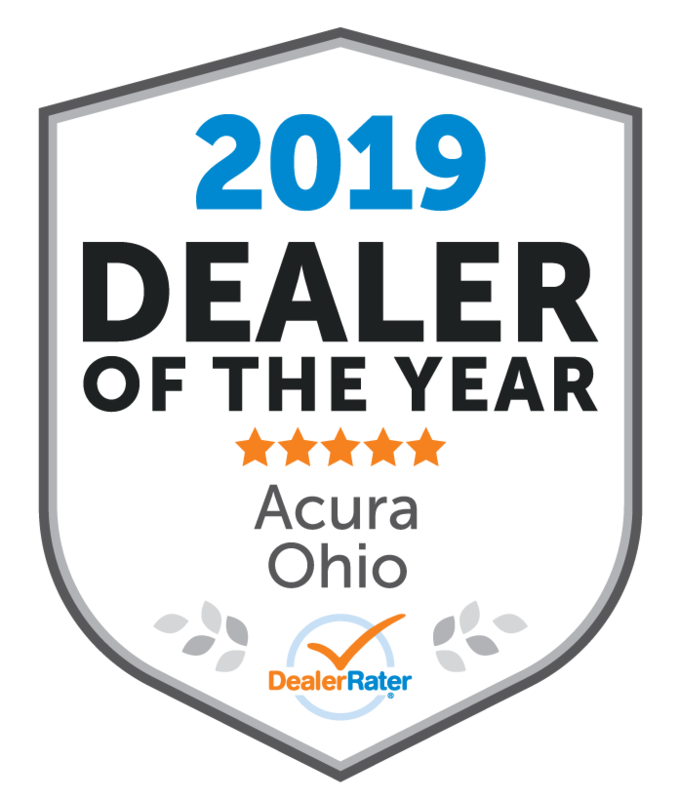 19/26 City/Highway MPG Celebrating 30 Years as Ohio's First Acura Dealer! 614-761-1222 Proudly Serving: Dublin, Columbus, Westerville, Chillicothe, Dayton, Xenia, Springfield, Wilmington, Beavercreek, Marysville, Cincinnati, Cleveland, Lancaster, West Jefferson, Grove City, and all of greater Ohio. 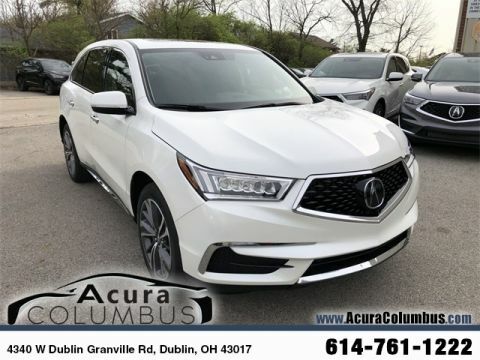 The latest Acura MDX brings an all-new dual-screen infotainment system, with Apple CarPlay/Android Auto included as standard and a touchscreen that functions faster than in previous models. Your ride is sharpened by available Super Handling All-Wheel Drive (SH-AWD), and comfort is assured through a first-class interior that offers available perforated leather upholstery, a standard 10-way power driver’s seat, and an available GPS-linked climate control system. You can even switch out the second-row bench seat for two sumptuous captain’s chairs. 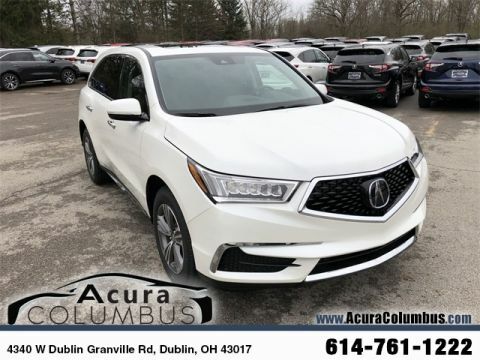 Edmunds.com notes that the Acura MDX has “evolved into a world-class three-row utility vehicle with a comfortable ride, excellent handling characteristics, and a wealth of advanced safety features.” To experience the next step forward, visit Acura Columbus today — you’ll find us in Dublin, OH, just a short drive west along Route 270 from Worthington and Westerville.